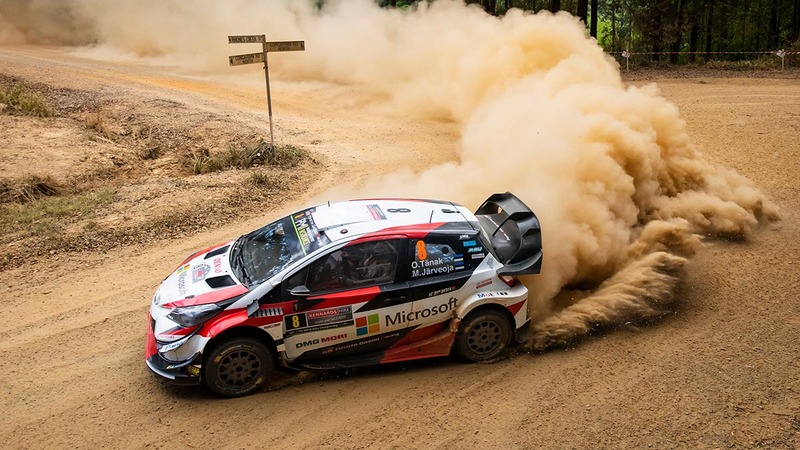 The outsider in the FIA World Rally Championship decider Down Under, Tänak must win this final round and claim maximum bonus points in Sunday’s Power Stage finale to earn a shot at a maiden crown. He is on course to achieve the first part of his target after a blistering charge from fifth to lead the three-day gravel road fixture by 21.9sec from Toyota Yaris team-mate Jari-Matti Latvala. Championship leader Sébastien Ogier lies sixth in a Ford Fiesta after a composed drive through dusty New South Wales shire roads near Coffs Harbour, and remains favourite to seal a sixth consecutive title. The Frenchman reined in his attacking instincts in the knowledge he held the upper hand over Thierry Neuville, who once again struggled in the conditions in his Hyundai i20. If positions stay the same tomorrow, Tänak and Neuville’s efforts would be insufficient to deprive Ogier of the title, irrespective of the Power Stage bonus points. Tänak won six of the day’s 10 speed tests to erase an overnight 16.9sec deficit to Mads Østberg. “Today was back to a normal day in the office, yesterday there were too many issues. I know Seb well, he’s a smart guy, but we’ll target our job and you never know what can happen,” he said. Latvala was first to relegate Østberg and led at the mid-leg service. He regretted not carrying two spare wheels this afternoon as worn tyres slowed the Finn and he was powerless to repel Tänak. Hayden Paddon won two stages to climb to third in an i20, 4.4sec behind Latvala and 20.3sec clear of a frustrated Østberg, who struggled with his Citroën C3’s balance all afternoon.